The Inland Carpet Python is a slow moving nocturnal snake with an adult length of up to 190cm. It is non-venomous, overcoming its prey by constriction. Colouring is generally black and grey with pale contrasting patterns and stripes. The python habitat includes hollow logs, rocky outcrops and thick scrub with deep litter. Rabbit burrows may also be used as shelter, with rabbits being a good food source. 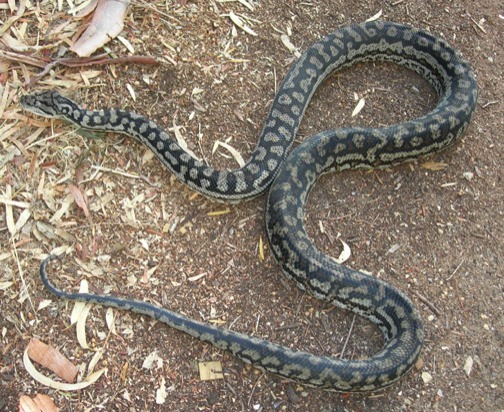 The Inland Carpet Python was once widespread in this area, but human activities have contributed to their decline, particularly fragmentation of habitat, land clearing, cultivation and firewood collection. Death through road kills and illegal capture for the pet trade are also factors. Conservation measures, together with a greater knowledge of the python should help to ensure that they survive in their environment and perhaps even flourish.